Learn more about using the NCCBP data from these members. Visit the National Benchmarking Conference website for additional case studies. Getting different results mandates doing things differently. What are some principles and practices that might foster student academic success? Founded in the CUNY tradition of access to excellence in 2012, Stella and Charles Guttman Community College supports student achievement in a dynamic, inclusive and intellectually engaging environment. Guttman Community College enrolled its first class of 289 students in fall 2012 with the goal of achieving a three-year graduation rate of 35% for its first cohort. After two years, 80 students from the College’s inaugural class (around 28%) graduated, which is significantly higher than the two-year national graduation rate at Large City community colleges. Telling a story is easy, but making your story transparent to accrediting bodies through the use of data is a struggle. 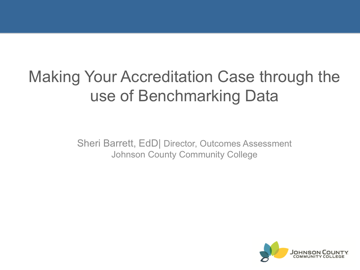 This presentation illustrates specific data from the NCCBP available to plug it into your accreditation processes. 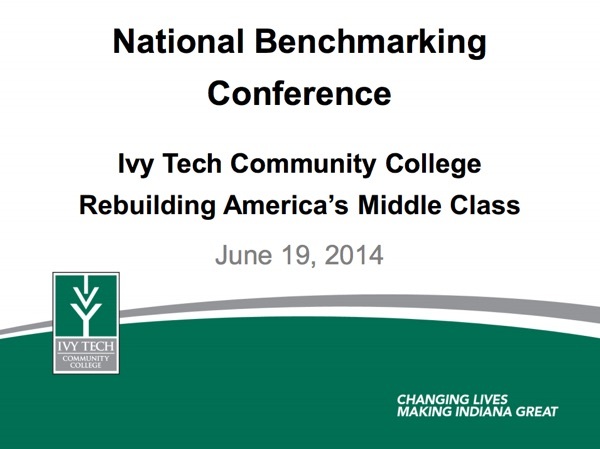 Ivy Tech uses the NCCBP data to understand its position compared to national results on key performance indicators to implement best practice efforts at its colleges. Doña Ana Community College, an NCCBP member since 2006, made a strategic and financial decision to stop participating in national surveys to provide data elements to support our HLC study and instead find better ways to use the data supplied in the NCCBP and our internal surveys. This presentation will share examples of how DACC has been able to use this approach to provide effective data support for our study. 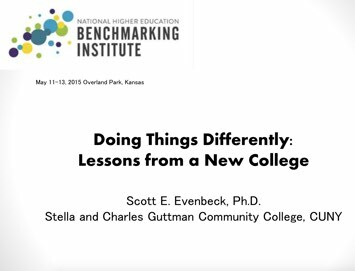 The National Community College Benchmarking Project (NCCBP) is a valuable data-rich source of information utilized in institutional strategic planning, program and policy improvement with applicable uses for institutional accreditation efforts which is not only beneficial at the institutional level, but can also drive and impact larger system-wide change at community college systems. 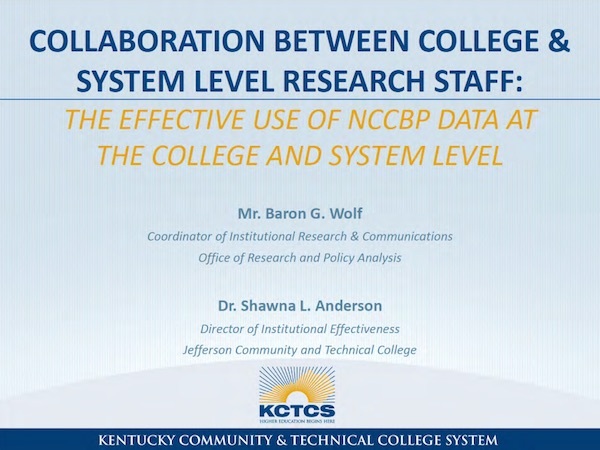 The presentation will describe both the use of benchmarking data at the system-level with senior leadership and will share specific strategies for collaboration between system-level research staff and the unique needs of the college community. Employers are often cited as a key component in the advancement of workforce development programs. 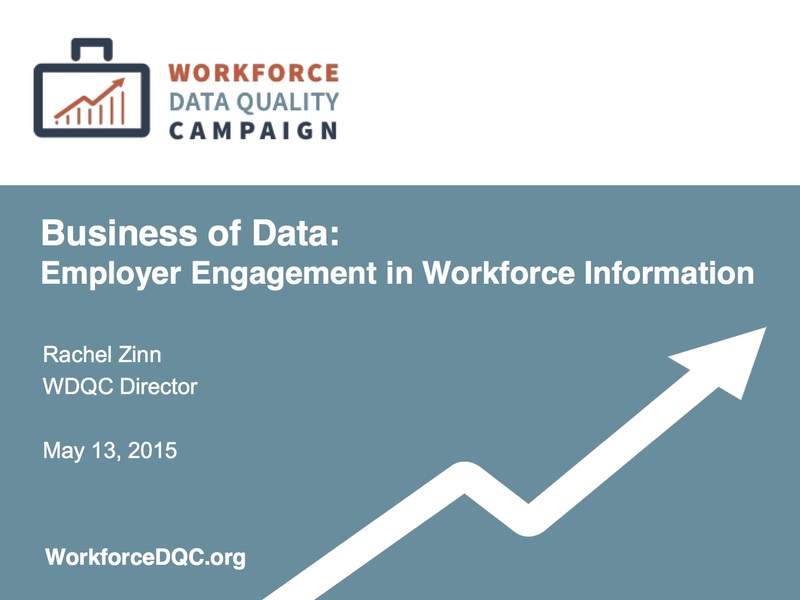 Workforce Data Quality Campaign (WDQC) contends that we cannot determine if our human capital strategy is up to the challenges of a 21st century economy without inclusive, aligned and market-relevant education and workforce data systems. We need federal- and state-sponsored data systems that will provide useful information to business leaders struggling to find skilled workers and wondering whether education and training programs are preparing enough prospective employees to meet their companies’ needs. Employers want and need information to help them make important choices. There is already a great deal of data collected by various government agencies to help answer critical policy questions about education and workforce development. The challenge is to understand how businesses use these data to inform decision making processes. This presentation will explore state efforts to engage the business community in understanding their needs and how they use publically-available (and funded) data systems. There are some states where employers are more active; for example, in Mississippi, the chair of the state’s longitudinal data system (called LifeTracks) governing board is also the president and chief executive officer of the state’s manufacturing association. Mississippi is unique in that it views its statewide longitudinal data system as an economic driver for the state. With focused employer engagement within these data systems, states as well as businesses can utilize the full potential of these data systems.